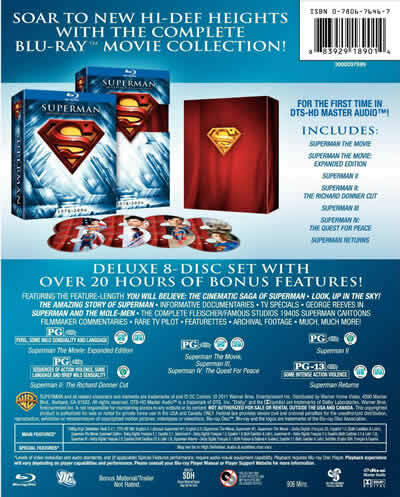 Superman fans will probably want this boxed set, which brings all of the Christopher Reeve Superman movies together, adding in the Bryan Singer/Brandon Routh reboot and a bonus disc of extras to the mix. In fact, you not only get all the movies and a bonus disc, you get two bonus versions of the first two movies as well. In all, it's a heckuva package. Director Richard Donner's sure touch allowed the first Superman film to walk the fine line between being an adventure with comedic moments and the campy sendups that were Supermans II and III. It's easily the best of the films. The first movie occupies the first two discs – the original theatrical version and the even better expanded edition that was already out on Blu-ray (though not with as good a soundtrack as this new release's). Superman II comes on two discs as well, one with the original theatrical release and the other with the superior "Richard Donner cut" that tries to restore the film to the better of the "Richards'" vision. Disc 5 is a single version of Superman III, a horrid movie that completed the series' move from serious superhero adventure to comedy, while Disc 6 contains Reeve's last outing in the super suit, the awful "Superman IV: the Quest for Peace." 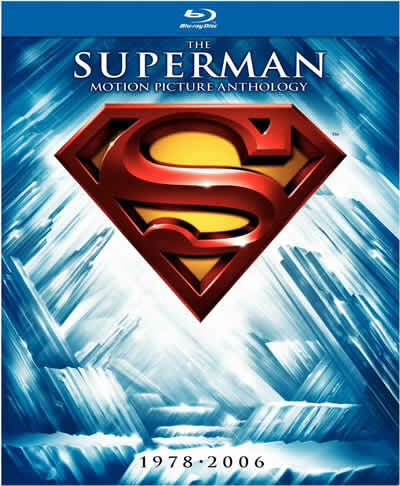 Disc 7 is the "Superman Returns" reboot, which I liked a lot better the second time but which still can't hold a candle to the Donner original, and Disc 8 is stuffed with extras I'll address shortly. It's cool having both versions of the first films. As mentioned, I like the expanded and the Donner Cut versions the best, but it's always a bonus when you have a choice. All movies in the set also feature abundant extras, from commentaries to restored scenes, to documentaries and the like. It's a super-sized super set! And boy, is it worth owning! Superman, of course, is the tale of an orphan from the doomed planet Krypton who's sent to Earth by his father in an attempt to save the boy's life. He's bought up on a farm near Smallville, in the US midwest, until he's eighteen years of age, at which time he discovers his destiny and moves to the big city of Metropolis to take up his adult life. In Metropolis Superman/Clark Kent (and who can't love Christopher Reeve's portrayal?) finds his true love in ace reporter-wannabe Lois Lane (Margot Kidder), and his ultimate nemesis (for a couple of the films, anyway!) in arch fiend Lex Luthor (Gene Hackman - who must have had a ball delivering such great lines – and, in "Superman Returns," Kevin Spacey, who isn't nearly as enjoyable). The first film, being an origin tale, takes a while to get to Superman himself, dealing with his origins and upbringing, but that's okay. The movie doesn't drag and these opening scenes (which take up about an hour of the film's running time) give the audience wonderful opportunities to watch some outstanding cinematography, John Williams' music at its best, and heartstrings-tugging plot development. Donner's "Superman" is full of wonderful moments and memorable lines and, unlike the Richard Lester Supermans that followed, it is never allowed to degenerate into farce. This Superman treats the characters and situations with respect, but not reverence. There are plenty of laughs, but you're laughing with the film and not at it - and that makes "Superman" a legitimate epic classic, while the rest of the series – Superman Returns excepted, possibly – are merely lightweight pretenders. Superman II, especially The Donner Cut version, was the best of the sequels, though it seemed a bit of a mishmash – and it undoubtedly was considering its production woes. Again, it's nice to get both the Lester and the Donner versions, the latter of which is a more serious take on the subject matter. The theatrical version includes a bunch of extras, including nine of the Fleischer Studios Superman cartoons, which were always pretty cool, while the Donner version's extras include eight Famous Studios cartoons as well as a feature on "restoring the vision" of Superman II. The story itself sees the Man of Steel giving up everything for the woman he loves, just in time for Earth to fall to the super villains first banished to the Phantom Zone at the beginning of the first movie (and again at the beginning of the Donner II). Superman III, the Blu-ray of which includes a commentary, extra scenes and a vintage TV special, completed the series' seduction by the dark side of the force. The fact that they cast the then-hot comedian Richard Pryor tells you all you need to know about the flick, though from a personal standpoint I enjoyed seeing my home town of Calgary standing in for Metropolis. Superman IV, which apparently was Reeve's pet project, is politically correct claptrap, but it also comes with extra scenes, a commentary and a vintage TV special. The story follows Superman on his altruistic quest to rid the world of nuclear weapons. Ah, but nuclear arms entrepreneur Lex Luthor might have something to say about it. Bryan Singer's "Superman Returns" is a lot better. He's the man who directed the first two X-Men movies, and his remake/update is kind of an homage to the Richard Donner original. It revisits the plot from the first two movies, sans General Zod and his super people of hench, and overall it's pretty good. Brandon Routh is a pretty good choice to wear Reeve's cape. He seems a bit young, but his delivery is very Reeve-like, and that isn’t a bad thing when you’re making connections and drawing parallels between the original and the new flick on the block. Two horrible casting decisions were made, however. Kevin Spacey as Lex Luthor isn’t fit to shine Gene Hackman’s shoes. His portrayal is lifeless and smaller than life compared with Hackman’s super over the top, scenery-chewing villain. And Frank Langella is far too subdued and, well, nice in his portrayal of Daily Planet editor Perry White. Again, Donner made the better casting choice with Jackie Cooper. But what can you do? The story is as the title suggests. Superman has been gone for five years, after having left suddenly and mysteriously – though as it turns out he had a pretty compelling reason to go. And as the world is wont to, it and its inhabitants have moved on. Lois Lane (Kate Bosworth, who’s more decorative than Margot Kidder but not as good in the role) got herself knocked up a few years back and is now living with her fiance, Richard, (James Marsden) who obviously fills the void left by both her Super little friend and her also vanished foil and colleague Clark Kent. Bringing in baby and hubby-compatible was a real risk (and perhaps an unnecessary one), but Singer and his co writers have pulled it off well. The family aspect gives Supe-baby three people to rescue instead of one, as well as giving him (and Clark) competition for what he had undoubtedly assumed would be Lois’ undivided attention. Luthor is still Luthor, other than Spacey's limp portrayal. He’s still "heavy" into real estate and his super crime is reminiscent of his "no fault" insurance scheme of the Donner Superman – only this time instead of putting millions of innocent people at risk he’s upping the ante. Singer's movie has the same basic look as Donner's, such as the crystal Kryptonian relics, but updated to take advantage of today’s state of the movie making art. And the homages to Donner’s version appear throughout, including the repetition of some lines exactly – or near enough to make one chuckle – as they appeared earlier. And of course the special effects are spectacular. I enjoyed particularly the first time Superman rescues Lois. In 1978 it was from a crashing Jet Ranger helicopter, but this time it’s bigger and better: a 777 spinning madly groundward from great height. It’s great! All films are presented in 1080/24p widescreen and the video quality is all over the map, which shouldn't really be a surprise considering their wide spacing in time. The first movie, alas, is the worst for picture quality – not that it's bad, mind you, it's just softer than I'd have liked. It seems a bit better than the original Blu-ray release (which was of the expanded edition), though, and for the most part, the colors and skintones and black levels are good. The expanded edition looks about the same. The Superman II's look a tad better, especially the theatrical version. The Donner cut suffers from using various sources to put the film together, but overall this is still the best version yet. Superman III looks far better than it deserves to, with wonderful detail, color and depth. Superman IV isn't quite as good, but it's still a very nice presentation. Unfortunately, the good picture quality shows up the substandard special effects. Superman Returns should be the best of the bunch, since it's only a few years old. But it isn't, and that's a shame. The picture looks dull and flat, with not a lot of that great depth you can get from a good Blu-ray. The movie could really use a good remastering. The news is better on the audio side, even on the oldest film in the collection. The new audio track on Superman is a dts-HD lossless track, and it sounds a lot better than the original Blu-ray's Dolby Digital. There's even reasonable low frequency effects use. Ditto for Superman II, though the Donner cut – undoubtedly thanks to its more patchwork nature – isn't quite as rich as the theatrical cut's. Supermans III and IV also deliver on the audio side, with nice dts-HD tracks of their own. Superman Returns has the best sound, though – as it should. It's very satisfying, clean and with good low end punch. The eighth disc will undoubtedly please Super fans, with its full length documentary "Look Up in the Sky! The Amazing Story of Superman" and five part doc about his cinematic adventures. There's also a TV special "The Science of Superman," "The Mythology of Superman," and even a 1958 TV pilot "The Adventures of Superpup." It's a very good set, even if all the movies aren't.